"Although smartphones and tablets are ubiquitous, many of the companies that make our everyday consumer products still rely on paper trails and manually updated spreadsheets to keep track of their production processes and delivery schedules," says Leyuan Shi, a professor of industrial and systems engineering at the University of Wisconsin-Madison. That's what she hopes to change with a research idea she first published almost two decades ago. During the past 16 years, Shi has visited more than 400 manufacturing companies in the United States, China, Europe, and Japan to personally observe their production processes. "And I have used that insight to develop tools that can make these processes run much more smoothly," she says. 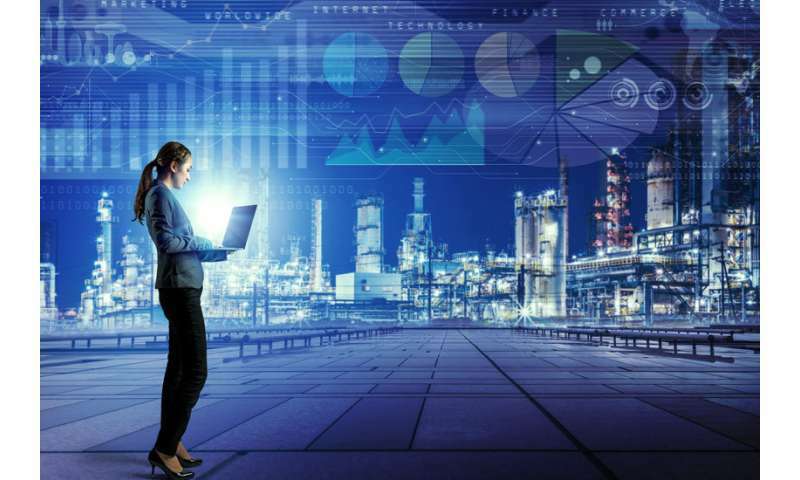 These tools are based on the notion of a "digital twin," or a computer representation of physical assets (machines and people) and processes that helps managers better operate the systems that connect them. Take, for example, a car manufacturing company with 15 different suppliers, each of which delivers a specific car part. As these parts arrive at the company, they are assembled by people who work in different departments, such as sheet metal cutting, heat treatment, welding, painting and so forth. The overall goal of this manufacturing system is to fill a set number of vehicle sales orders. That's a classic example of a supply chain: a set of processes that link raw source materials to final consumer products. A company's goal for making supply chain manufacturing more efficient might include decreasing production downtime due to delivery delays for required parts, and better adjusting to unpredictable events, such as rush orders, machine breakdowns, or defective parts. The technology Shi has developed helps managers meet these goals. With a database system, user software and equipment sensors, it creates a digital twin of what is physically happening at the supply facilities and shop floors. Managers can use that digital representation to visually track the global production progress in real time and adjust workflows as needed. The tool provides continuously updated start times for each assembly stage and constantly refined delivery times for the customers who ordered the cars. "That's what we mean by smart manufacturing," Shi says. The technology is helpful for all industries, but is especially important in custom manufacturing. Unlike mass production companies, custom manufacturers typically receive a lower number of highly customized (and more expensive) sales orders and may also experience wilder market swings. This high variability in demand makes planning challenging, and the ability to respond quickly and efficiently to individual orders becomes a critical part of the business model. At the heart of Shi's technology is a mathematical algorithm she originally published as a research paper in 2000, followed by a book on the subject eight years later. Although the methodology, known as nested partitioning, is not new, its implementation is only now becoming feasible. It relies on ultra-fast computers and wireless technology that connects machines, devices, and people to the internet and to each other: the Internet of Things. To help translate her research into practical applications, Shi formed a spinoff company, LS Optimal, in 1995. Initially conceived for consulting purposes only, it now has several full-time employees in the United States who help industry clients develop and implement smart manufacturing processes. "It was a long time coming, but we're finally seeing a real paradigm shift in the industry," Shi says. "By giving manufacturing companies the ability to track the progress of their sales orders in real time and manage their shop floors proactively, they can deliver high-quality products to their customers much faster than before."